The City of Springfield is truly the Land of Lincoln and they would be remiss without remembering their favorite son. The city will honor our 16th President, Abraham Lincoln with the accurate reenactment of the historic anniversary of his funeral procession. While several events that kick off in April are leading up to this somber occasion, it is May 1st and 2nd that the actual procession will take place. The train will arrive at the Amtrak station. The train carrying the replicated coffin covered with an American flag that has been created by the original manufacturer of the flag that covered Lincoln’s body. The accurate to the time period train will arrive at the very same station that Lincoln’s body arrived 150 years ago. The coffin will be carried in a horse drawn specially built replica of the original Lincoln hearse following much of the historic route from the station to Washington and 6th Street where the opening ceremonies will commence. The coffin will be guarded over by Civil War re-enactor during a candle light vigil. On May 2nd the recreated Lincoln hearse will transport the coffin to Oak Ridge Cemetery our 16th President’s final resting place. The procession will go through the recently replicated First Street entrance and proceed to the old receiving vault. The First Street entrance was just recently completed with the funeral procession a reason to make the $200,000 project a priority. 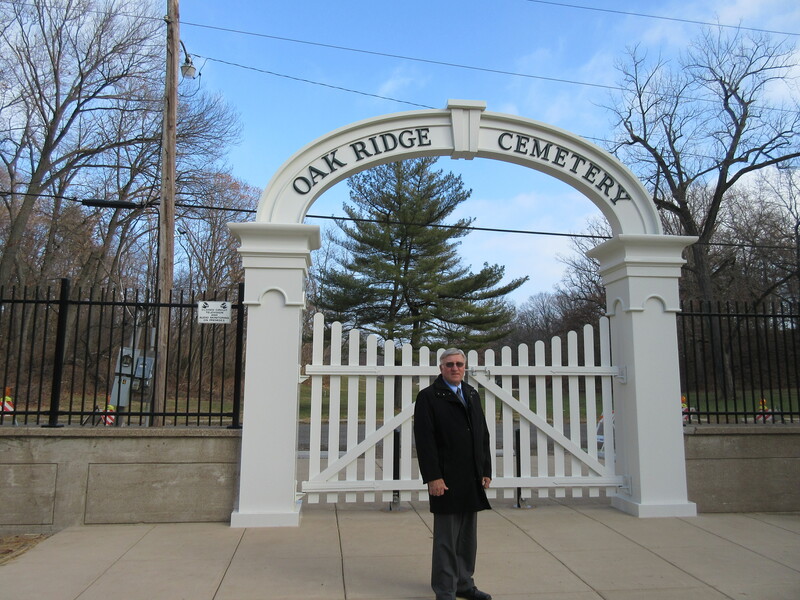 On December 3rd Oak Ridge Cemetery held a dedication of the gate that is now an updated version of the one back in Lincoln’s time. While the original gate was wooden, the brushed aluminum appears to be wooden. The dirt entrance is now a concrete walkway with a gate and bollards it can be opened and closed for foot traffic. There is an interpretive plaque (written by historian Ian Patrick Hunt) explaining the historical significance of the gate. “This presents the city with one more historical site,” Mike Lelys Executive Director said. My wife and I were just in Springfield last summer, and I felt like I really go to know the man! I wish I could be there this spring for the procession, but it will not likely be in our budget to make the long drive from Central Missouri. Do you know of any plans at the Lincoln Presidential Museum in conjunction with the procession? The re-creation there of his body lying in state in the capitol was an especially moving experience for me. It seems that most of the plans are the procession itself, but I am not sure about the museum, they will probably have an updated exhibit. It will be a major event that I am sorry you will miss. All the Lincoln sites are wonderful when in town check them all out, the Presidential Museum is quite fascinating. There is also a great Lincoln museum in Lincoln Illinois as well. You can subscribe there is a place to put in your email right on the front of the page, I would love to have you sign up. You can sign up onsite, just add in your email. Thanks, what is your website? All I saw was a Spider-Man youtube video?